CW: You are often heard to espouse the term “pathway”. What do you mean by this term and how has it come to fruition with the club? DC: Based on my experience in coaching and training with other sports (soccer, hockey), I felt that pathway was well supported with the male side of club rugby but less so with girls. In my view, we needed to focus on the development of a similar pathway system for the girls with separation from the boys at the appropriate time. Having coached my daughter in soccer, I felt that the best time was around U12 to U14 when girl’s maturity brings a different focus to their many of their pursuits – academic, sports and otherwise. 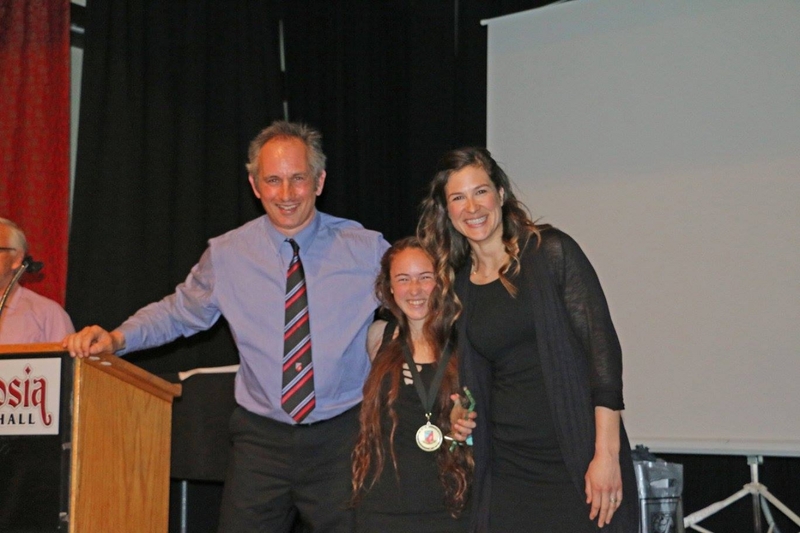 At the time, there were a few examples of successful programs like Cowichan’s girls program which were fed from two strong high school programs (Cowichan/Brentwood). Even with a strong U16-U18 team, I was not seeing a pathway within the clubs. Most of the girls were coming from the high school programs not from the club’s mini programs. The one region that seemed to come close to that pathway development was Abbotsford that had strong ties and involvement in multiple middle and high schools that developed a solid based of girls that have played the sport from a young age. Initially within the club, this pathway grew somewhat organically. The first year was about getting the program off the ground. Once we started to have a critical mass (20) in the second year, I began to notice the development patterns/differences in the group. In addition, as many of games or practices coincided with the mini practices/jamborees, I also observed that there were many U12 girls that could join in with our girls for certain drills. As a result, we would invite some of the U12 girls over to our Sunday practices so that they could train in an all-girls format. The light bulb went on! A few weeks later at one of the mini jamborees that coincided with our girls practice, I met a coach from Campbell River, Erin Young, who had been working hard with a group of older elementary, middle school girls. We decided to try this cohort of younger girls and some of our less experienced U14 girls in some controlled all-girls scrimmages. Suddenly, this all-girls format removed the encumbrances that playing with boys can bring, and with some minor rule modifications around the breakdown, we had these girls having fun playing rugby with structure, running, passing and tackling. A girls U14 format was born and Erin and I knew then that this was going to work and was going to keep these girls involved in the game. That second year brought another coach into the fold. A former teammate of Marley’s, Anna Schnell, joined the coaching team. These two coaches were the perfect complement (one being a forward and the other a RWC and Canada Fly-half). This allowed me to focus on the U14 group which we began pushing at the remaining jamborees and would have all-girls games that coincided with the mini-jamborees. Any of the young girls participating in the jamborees were welcome to join our all-girls games. 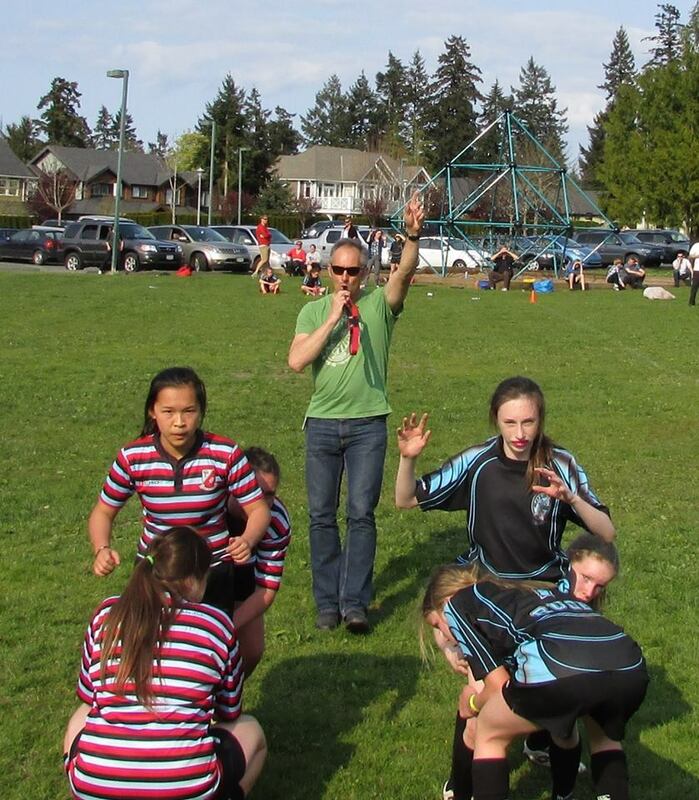 So, fast forward four years later, and BCRU was able to hold a full-fledged U14 division for the regional championships with teams being fielded for both the south and north island, Fraser Valley and other regions in the province. We are now seeing other clubs with full-fledged U14 divisions and talking pathway development for their girl youth athletes. CW: What rewards have motivated you to “hang in there”? DC: I think it is to see the development of the athletes through the pathway and it is especially pleasing to see those athletes that have come up from the mini programs. Sophie and Caroline are the standard bearers as they were the first within the club but we now have a multitude of girls that are making their way through the pathway and enjoying the game and team experience along the way. For me the motivation is two-fold. Firstly, empowering these young female athletes by introducing and seeing them thrive in sport is tremendous. The inclusiveness and culture of the game was one of the attractions for me and I love to see the girls embracing that culture and creating a great team dynamic. Secondly, it is the people that I get to work with within the club and program. I may have been a catalyst to get something started at CW, but it is the supporting cast that deserves the accolades. We have been truly blessed with our coaches and management teams over the last 6 years. I mentioned a few at the start but Megan Gibbs, Jenna Hoska and past manager Sandra Hudson have been made great contributions. Our current team from U12 thru to U18 are passionate contributors in their roles and in my view, makes this program successful. It is tremendous to also see the development in the coaching and management teams and I feel that we have all grown in our club roles through the development of this program. In addition, supporting the club in its fund-raising and web site development have been very satisfying. Taking the club into the Social Media era has been fun and even though a technologist, it has taught me a lot!